Fishing For Customers: What's Your Specialty? 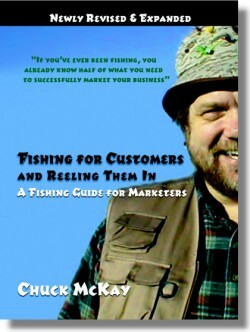 Fishing For Customers - Free Small Business Marketing and Advertising Tools, Tips, Articles, Strategies, and Advice. Fishing For Customers: What's Your Specialty? I have a friend who's very talented. He's an accomplished musician, writer, and marketer. He owns and operates three profitable businesses which he grew from scratch. And yet, when people are looking to hire help in any of these areas, he's frequently passed over. He isn't the first choice when people want to hire a performer, or a composer, or a consultant. While you're pondering that, consider this: Proctor & Gamble manufactures detergents. They make Tide, and Gain, and Ivory, Era, Dreft, and Cheer. Are there significant differences between these products? Yes, there are. But by far the biggest differences are in their marketing. Each is marketed to a different group of consumers as a solution to their specific concern. Tide gets clothes clean. Ivory provides a gentle and pure clean. Gain makes your clothes smell clean. Dreft leaves clothes soft. Era is tough on stains. Cheer has color guard. Why not an all-purpose laundry detergent? Why doesn't Proctor & Gamble make one detergent which gets clothes clean, makes them smell clean, leaves them soft, is tough on stains, and guards against fading and color transfer? Think about it. Would you choose an “our product does everything” detergent if your biggest issue was stain removal? Or would you choose a product designed for stain treatment? If your biggest issue was stains, would you choose a product that left clothes soft? Or one that smelled better? No. You'd buy a product that you believed would solve your problem. You'd "hire" a specialist. The biggest fear people have about specialization is all of the business they believe they'll be passing up. When they declare themselves a specialist in left-handed widgets, they'll miss out on the right-handed widget jobs. Guess what? They won't get the work by not declaring a specialty, either. Those jobs will be snagged by the right-handed widget specialist. Tide gets clothes clean. Specialists make more money. I can hear you right now saying, “But I don't manufacture detergent.” It doesn't matter. Whatever you do, you'll do better as a specialist. Jermaine doesn't sell music instruction. Have you ever heard of Jermaine Griggs? He's a 25-year-old musician. In 2000 (when he was 17 years old), he formed a company, Hear and Play, to sell music instruction. How many music instruction courses are there? Dozens? Hundreds? Thousands? Yet, Jermaine's company, Hear and Play, grosses over a million dollars a year. How narrow should your specialty be? He doesn't sell piano instruction. He doesn't sell Gospel piano instruction. He sells books and videos that teach you how to play Gospel piano BY EAR. Don't be an accountant. Be an accountant that understands the specialized needs of the hospitality industry. Don't be a travel agent. Be a travel agent who specializes in honeymoon trips to Cancun. Don't be a mechanic. Be a mechanic who only works on BMWs. What should your specialty be? There are three questions you must answer yourself. 1.What are your passions? What would you do for free because you enjoy it so much? 2.Can you make a living doing what you love? Is there enough of a market to support you? 3.Can you articulate in a single declarative sentence what it is you do? Jermaine helps you learn to play Gospel piano by ear. Ban won't wear off as the day wears on. A simple declarative sentence that sums up what you do. Answer those three questions, and take the plunge. What's your specialty going to be?